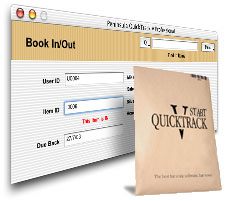 QuickTrack Start Item, Asset Tracking and Library Software system for Mac and PC. "Setting Up A Barcode Loan, Item, Asset Management System or Library Software Just Got Simple..."
Peninsula QuickTrack V Start is an easy to use software application for keeping item records and tracking their whereabouts and movements amongst many users or locations. Details of items and users or locations are filed and can then be booked in or out by scanning barcodes or using the keyboard. Quicktrack Start is a professional barcode lending and tracking system. It is equally usefull in a commercial situation, in a tool room, fixed asset tracking, tracking item loans, as it is at home, to help catalogue your collection for insurance purposes, or simply so you know who you have leant things to. Scan the barcode from a CD, DVD, Video or Book to have QuickTrack complete the details of the product for you over the internet. One scan downloads the information for 99% of these items (it can even look up SBN numbers from books from the 1950's). QuickTrack Start has built in barcode printing capabilities, it can print to any printer (ink jet, laser or thermal transfer), to make your own barcode labels. Use standard sheets of labels on your printer to produce barcodes for your items. QuickTrack start is free of charge with all our Barcode Readers, the Phoenix II, the Eagle II, the Swift III. Simply scan the special code on the setup sheet with your barcode reader to fully enable QuickTrack Start. Choice Of Platforms (Mac, PC or OSX). QuickTrack V Start is available for Macintosh (OSX and Classic) and Windows platforms. Follow the link below to download QuickTrack V Start. To unleash its full potential, you will need to scan the Enabler Codes that are supplied with your Peninsula barcode reader.